Bunka Fashion College student in Shinjuku, Tokyo wearing a vintage Japanese kimono, red high heels, and a victory rolls hairstyle. Japanese girl in pink kimono and floral obi belt while out and about in Harajuku. 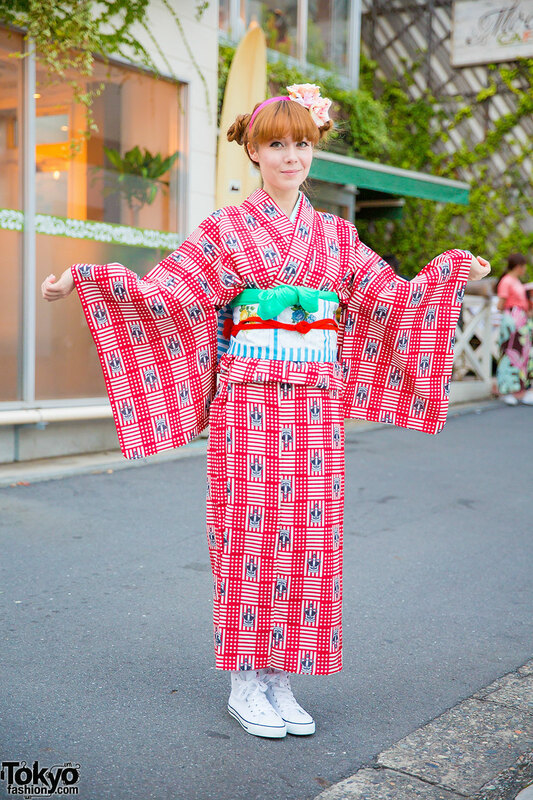 Japanese student in a printed top, yukata obi, and red pleated pants while out and about in Harajuku. 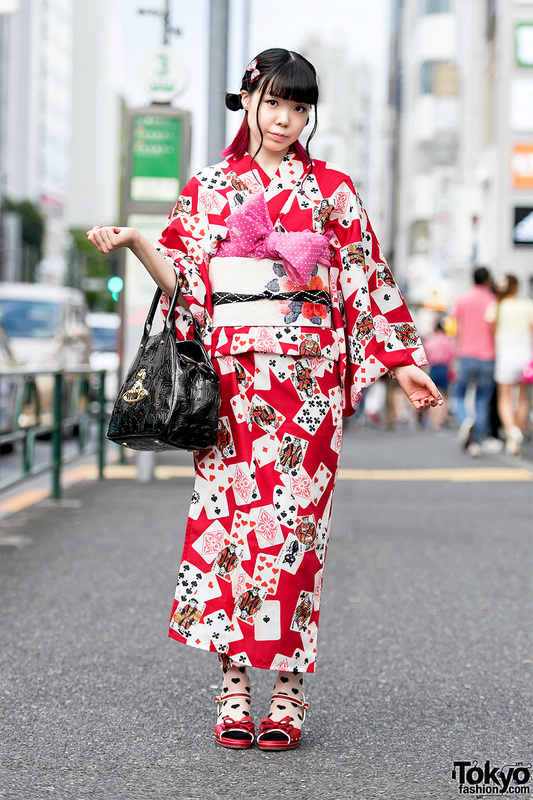 Japanese model wearing a red and black kimono along with ankle boots on the street in Harajuku, Tokyo. Mother and daughter wearing colorful matching yukata, geta sandals, obis, and floral accessories on the street in Harajuku. Pink-haired Japanese designer wearing a playing card print yukata with a vintage floral obi, Mezzo Piano wedges, and a Vivienne Westwood handbag. Harajuku girls wearing pretty Japanese kimono with cute modern accessories, platform sandals, and sunglasses. Harajuku girl in crown-print kimono, floral obi, flower headband and white sneakers. 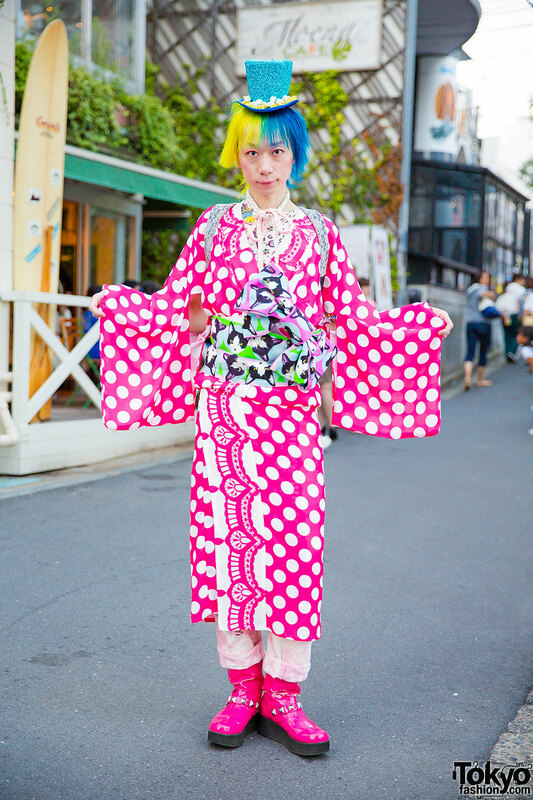 Harajuku guy with half yellow, half blue hair, hat, pink polka dot kimono, cat print obi, customized flower randoseru and pink patent boots.